Most digital cameras do not have multiple exposure capabilities. With the use of Adobe Photoshop, you can create your own multiple exposure photographs. This technique is for a double exposure. 1. Open the file. Choose File --> Open --> Enter the image name to be worked on. 2. 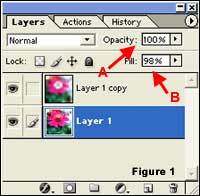 Choose Layer --> Duplicate Copy or hold the Ctrl Key down and hit the J key for a duplicate copy of the image. This layer is the layer you are going to work on. 3. Select the duplicate layer. 4. Choose Filter --> Blur --> Gaussian Blur and adjust the radius to a number that blurs the image but still leaves it recognizable. Click OK.
5. Set the opacity to 85% to 90% (Figure 1 A) and the fill to 95% (Figure 1 B). Keep adjusting the two settings until you are content with the look of your photograph. 6. Select the eraser and set the opacity to 70% (Figure 2 A) and the flow to 80% (Figure 2 B). Use any settings that need to erase sections of the duplicate layer. 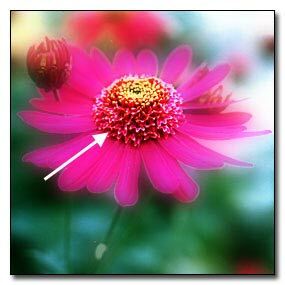 In this photograph, the center of the flower was erase on the duplicate layer to display a sharp, distinct section of the flower. 7. When you a satisfied with result, save the image.